It is difficult to try to describe life in Frieth over the last seventy years - to know where to begin or end for there is a wealth of material and I hope more people will write their reminiscences to add to this local collection (see accounts by Mrs. Ing and Mr. E. Collier). So here are just a few points of general interest. 1900 to 1914 were golden years in Edwardian England ­ life for the average family improved slowly year by year as the nation's wealth increased. This was a house building period and Frieth had its share of new houses. Inevitably the young men and women tended to leave the village to look for work, some to local towns, some to London and some emigrated to Canada and Australia. Around Frieth timber was cut to keep the Wycombe factories going [and our own West & Collier], bodgers and sawyers were busy in the woods, but under the Parmoor management, woods were replanted and conserved. The Great War came and went leaving us with a complete Roll of Honour of all Frieth men who served in the Forces (compiled by the schoolmaster) and a sad little list of names in the church of those who never returned. After the 1914-18 war farming fell into the doldrums, home produce could not compete with the flood of cheap food from abroad. 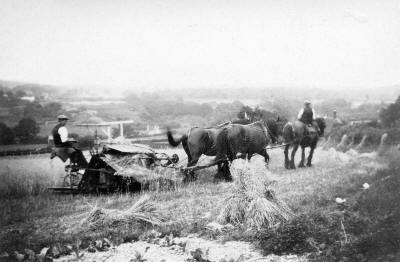 Such farming as there was became mixed farming with a bias in the 1930's to dairy farming for the London market. 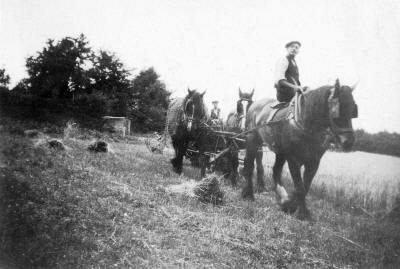 [Peter Janes, whose family used to live at Willems at Spurgrove, recently (December 2012) sent me a number of photographs of farming in Frieth taken by his father in the 1920s near their house. A reaper-binder (possibly made by Bisset of Blairgowrie) drawn by three horses in the field below Willems. To the right of the lead horse can just be seen Elder Barn and behind the tail of the rearmost horse The Prince Albert. The white area at the bottom of the frame looks like a vegetable patch. 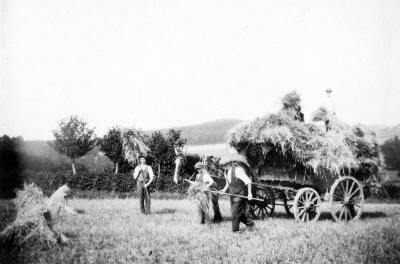 Loading the sheaves onto a wagon to go for threshing. Increasingly the young people left the village in search of work or lived in Frieth and worked in High Wycombe ­ this was possible because, at last, there was public transport. Good roads had been made to Henley, Wycombe and Marlow during the preceding century. Just after World War I, buses started running from High Wycombe to Lane End - these were converted Army lorries with exciting names like "The Valiant", "The Victory", "The Don' t Worry" and "The Reliance". Often their names belied them for they found the long pull up Chipps Hill from Piddington to Wheeler End just too much and passengers had to get out and walk up the hill behind the bus! I do not know how many of these buses ran on to Frieth, but soon they took the place of the carrier's carts. Later three or four small bus companies started up and ran efficient services to all the small villages on this side of the Wycombe Valley. Inevitably they were bought up by the Thames Valley Bus Services. During the 1930's many cottages in Frieth became vacant and were sold as weekend cottages. Electric light, mains water and cesspool drainage came to the village and this encouraged one or two retired London businessmen to build houses like "Little Barlows", "Down the Lane" and "Maidencraft" (built by a retired tea planter). However, the village remained small and comparatively unknown until, with the advent of the small, popular car in the late 1930's, Londoners began to "discover" it. With World War II came mass evacuation of London and Frieth received its quota of evacuees. 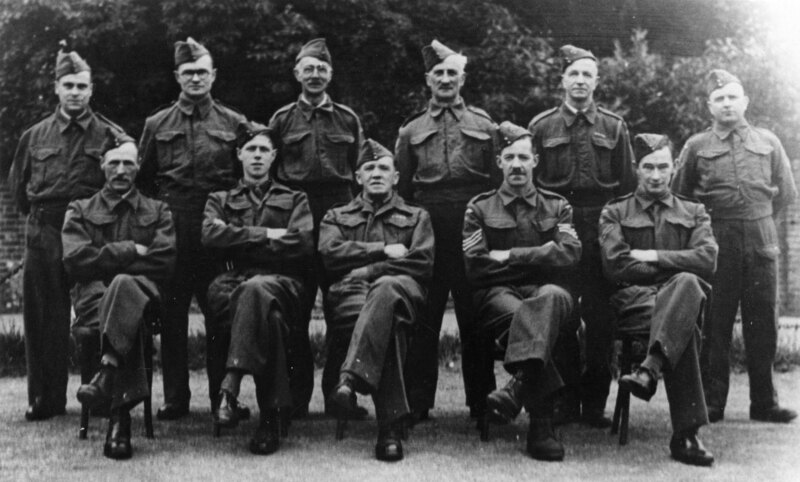 Frieth had its First Aid Post, a Search Light Unit in Innings Meadow and the Home Guard. Which surround it like a wreath. And moorhens when its still. These are people, not just things. But the churchyard holds the ghosts. Made noise on lane and street. But I love iron handicraft." Was an artist -and how real! Farming by necessity took a distinct turn for the better and once more pigs, chickens and bees came into their own. Until about 1935 the only industries in Wycombe, apart from two or three engineering firms and paper factories, were all associated with the furniture trades. Then light industries began to establish themselves on the two trading estates. After 1945 more and more industries were established not only in Wycombe but in Slough and Maidenhead - more industries, more work -more work, more people - more people, more houses. Frieth grew in the post war period. A small Council Estate was built in the village and many private houses, principally at Spurgrove. The nature of employment had changed. Now comparatively few people worked on the land, farms tended to be "Hobby" farms - Frieth was no longer a farming community. Today the majority of the village's working force are commuters. The latest trend in farming seems to be back to the larger landowner. In 1968 a breakdown of the population of Frieth showed that there were about 470 people in the village (excluding Parmoor and Moor Common areas) living in 172 families. 36 families could trace their descent from ancestors living in Frieth over the past 150 years. 44 of the other families had moved in from about a seven mile radius. So 80 families could claim to be "Local". 29 families had moved in from a distance over the years. 63 families had moved into the village in the past 10 years.